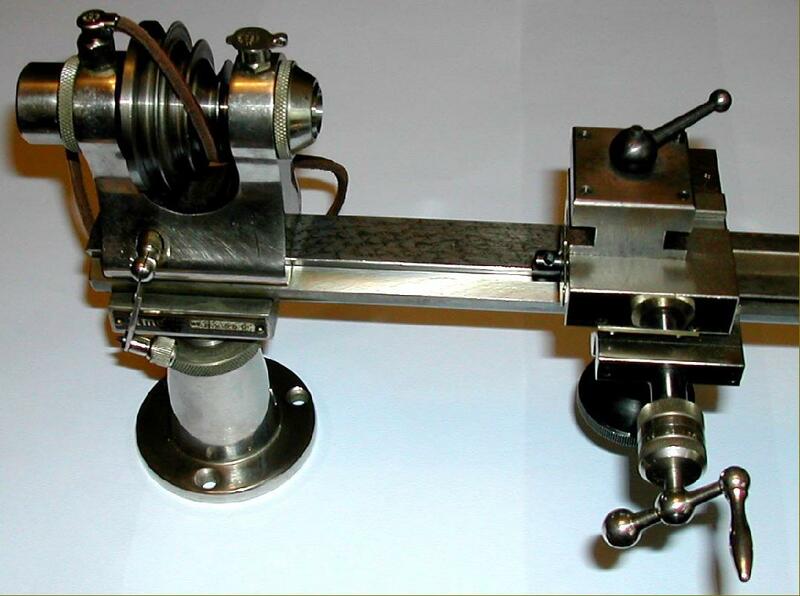 Although several UK companies re-branded watch and clockmaker's lathes as their own - especially the London dealers George Adams who, pre-WW2, offered replicas of G.Boley and Boley & Leinen machines - genuine British makers of watch and clockmakers' lathes are rare. Probably the best known are Pultra and two others: I.M.E. and B.T.M. The Ideal Machine Tool and Engineering Company (I.M.E.) 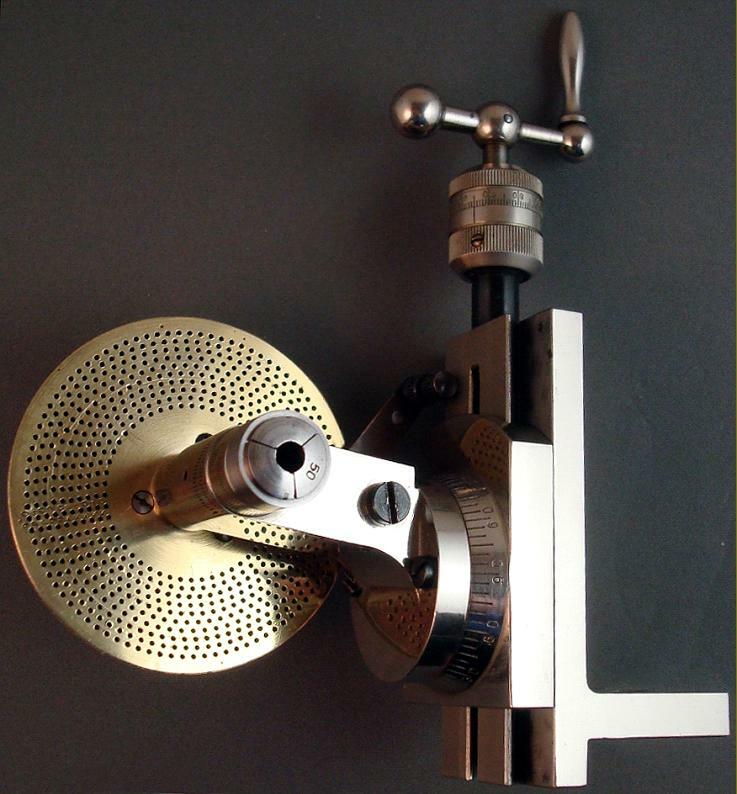 were originally based at 282 Kingsland Road, London E.8, England and made a small range of precision machine tools that including an 8 mm watchmakers' lathe with an 80 mm centre height, two larger instrument-makers' lathes of later manufacture (models 100 and 300) and a fine quality drill. All the lathes, and the drill, were their own design with the firm's original product, the 8 mm lathe, being built in relatively large numbers (as WB and CWO variants) and so still frequently encountered today. Individual model types included the WB1/15, WB5/15, WB6/15 as well as complete boxed "Workshop Outfits" CWO/15, COM/15, COMB/100 and 100/GIB/A-B. The most expensive and best presented of the various types was the now rare and originally expensive Complete Workshop Outfit model number CWO/8 - one of the first watchmakers' lathes to be offered on a self-contained base - in this case a 28 lb piece of cast-iron 13" x 15" with an adjustable motor mount, collet tray, motor with foot controller, countershaft unit and an overhead-driven 3 foot long flexible drive shaft. 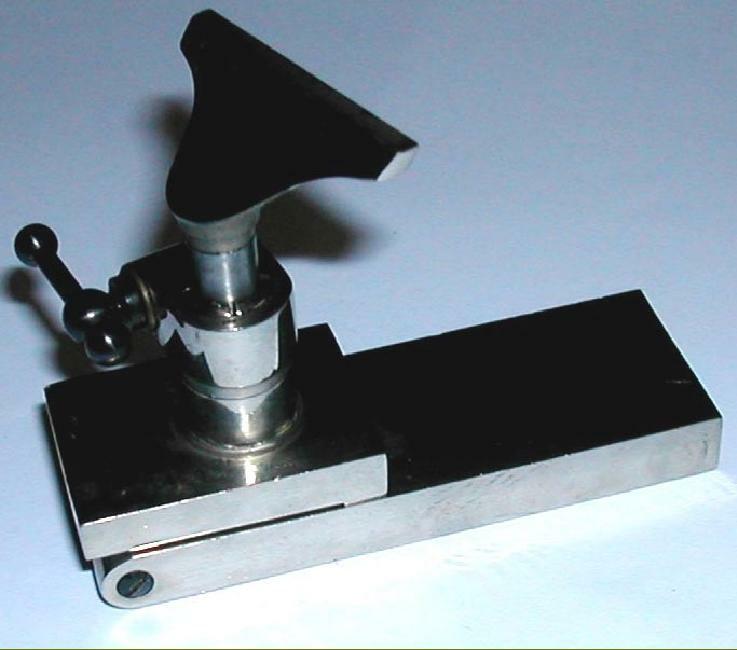 The latter was designed to run at between 800 and 14,000 rpm and included a handle adapted to hold 8 mm collets. Beautifully conceived, every element of the design had been thoroughly considered; it was constructed of the finest quality materials and assembled and tested with great care - of all the English-made watchmakers' lathes this is, without doubt, the finest. Unusually for this class of machine, it had a V-edged bed made in tool steel that was, needless to say, finish ground then hand scraped and nickel plated; the 254 mm-long short-bed version had a single, adjustable, swivelling foot while the longer beds (lengths up to 350 mm were available) sat on twin (rigid) versions of the same mounting. Made of nickel-chromium steel, the hollow 8 mm-collet headstock spindle was hardened, heat-treated, ground and finally lapped to a perfect fit in its high-carbon steel conical bearings. The interior of each bearing was fitted with an oil-retaining felt washer with an exterior dust cover was to provide further protection against the ingress of dirt. While, on early models, each bearing housing was topped with almost flush-fitting, spring-loaded oilers later versions had tall, flip-open caps and oil feed through wicks. 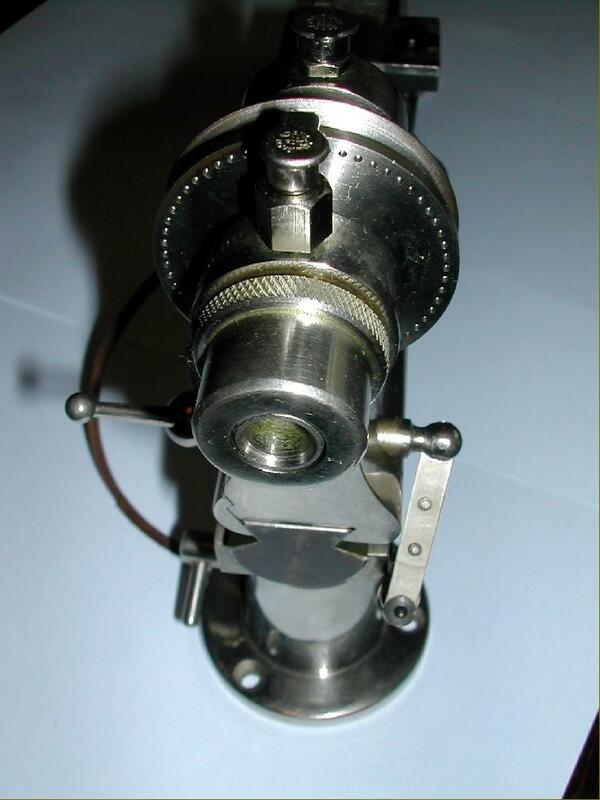 The balanced 3-step headstock pulley was in duralumin but with a high-carbon steel plate fastened to its left-hand face into which was drilled a ring of 60 division holes - although the factory also offered alternative plates, with different numbers of holes, to special order. A weak point was the use of a simple swing-in-and-out pin (on an adjustable spring arm) to index the pulley - some competing lathes having a more robust arrangement where the pin was supported by being passed through the left-hand wall of the headstock casting. 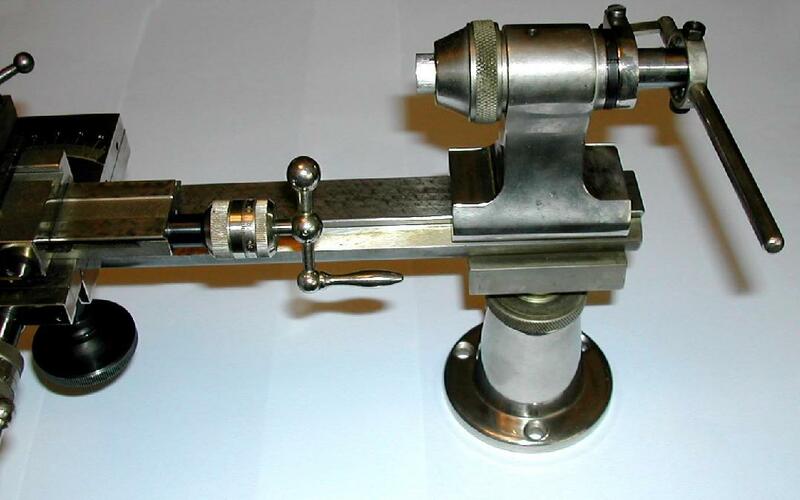 To ensure absolute concentricity between headstock and tailstock the two units were assembled on a "master" bed and their bases ground and scraped until perfect alignment had been achieved. Fastened to the bed with full-length clamps, both headstock and tailstock could be firmly held with just a light touch on their locking handles. 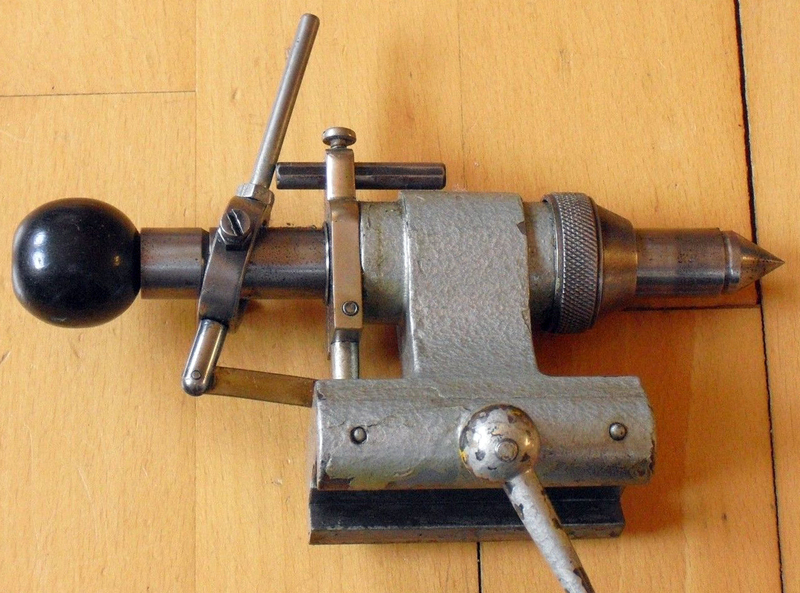 The standard tailstock featured a "push" barrel that ran through a 4-jaw collet compressed by turning a knurled cap - the system ensuring that fittings were held in perfect concentricity with the bore. 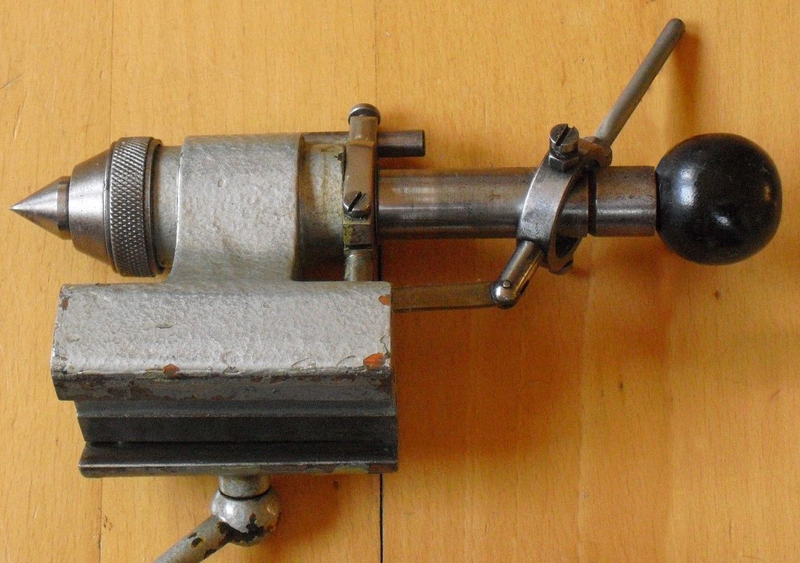 Other options for the tailstock included a screw-feed barrel (with a graduated collar) and a lever-feed attachment with a barrel able to take either 6 mm collets or the same 8 mm type as the headstock. A pleasing touch was the provision of a replaceable spindle bush in the tailstock allowing an easy repair without affecting the accuracy of the unit. 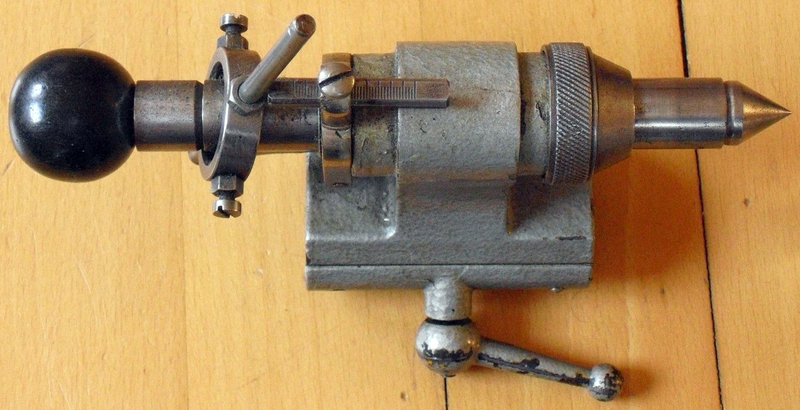 Even the T-rest was a novel design, with the shaft of the T set into a miniature 4-jaw collet fixing that was opened and closed by a four-spoke ring surrounding its base. Ingeniously, screw-adjustable balls were fitted to compensate for the wear on the rest. Besides a conventional compound slide, a special version was produced that had both handles facing the front - but with the top slide incorporating a neat helical gear arrangement to turn the drive through ninety degrees. 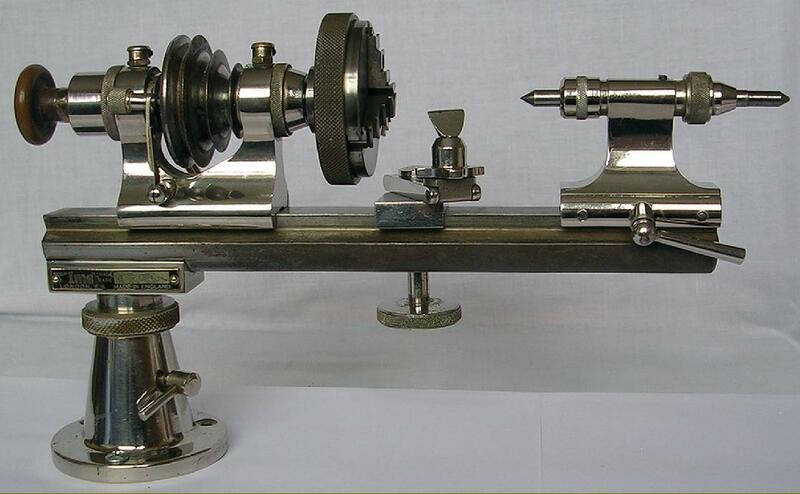 After assembly, the advertising literature claimed that each lathe was run at 5000 rpm for eight hours after which it was dismantled, inspected and re-assembled before being packed for sale into its polished mahogany box complete with a signed test certificate. Although surviving advertising literature only mentions an 8 mm lathe it is almost certain that a 6 mm version was built as well, some 8 mm lathes having being discovered with a supplementary, 1.625" centre height headstock and a set of 6 mm collets in their boxes. If the lathe is complete as sold, the underneath of these supplementary headstocks may well be found stamped with a production number corresponding to the one found on the maker's test certificate. A surprising number of these fine lathes have survived, including some very lightly-used, complete and boxed examples. 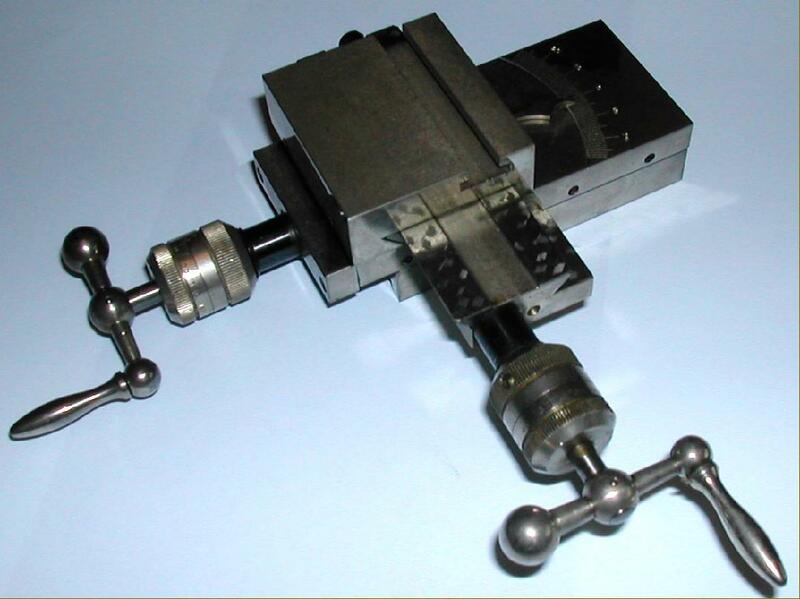 Above: IME Model WB1/10" or, when supplied without a tailstock, Model SA/3. Twin front-facing handle Compound Slide assembly shown with both the Vertical Slide and Universal Milling Attachment in place. The latter could be converted into a Grinding Attachment by removing the indexing plate and replacing it with a driving pulley. 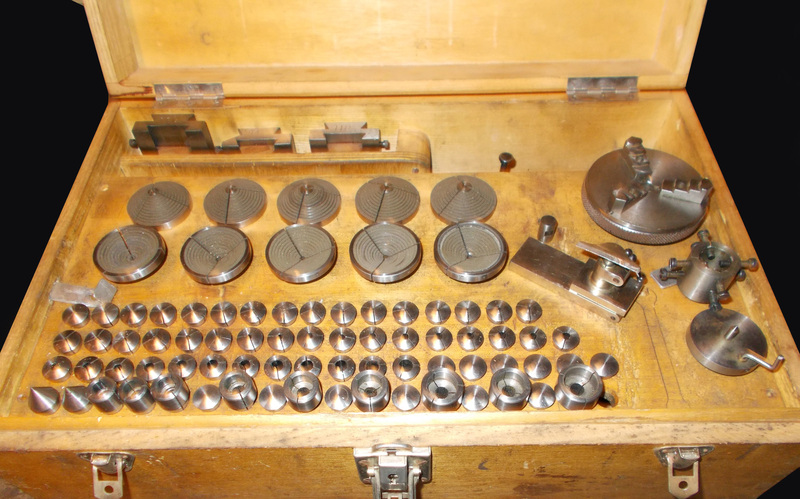 The rare and originally expensive Complete Workshop Outfit model number CWO/8 was one of the first watchmakers' lathes to be offered on a self-contained base - in this case a 28 lb piece of cast-iron 13" x 15" with an adjustable motor mount, collet tray, motor with foot controller, countershaft unit and an overhead-driven 3 foot long flexible drive shaft. The latter was designed to run at between 800 and 14,000 rpm and included a handle adapted to hold 8 mm collets.